Need a crash course on the present state of the world? Want to untangle the terminology, separate the victims from the victimizers, understand the dynamics of unilateralism, and deduce what can be done about it all? I’d like to introduce you to a small literary arsenal. A good place to begin is the book Hugo Chavez recommended to the world from the podium of the United Nations last September. 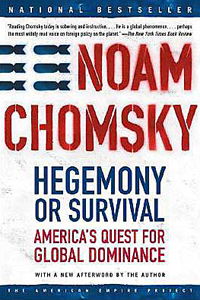 Hegemony or Survival: America’s Quest for Global Dominance, by Noam Chomsky (New York: Metropolitan Books, 2003, 278 pages), lives up to its title. The prolific MIT professor of linguistics and philosophy explains how the American ruling class has long been in the business of imposing its will over an ever expanding domain of lands and peoples. Its behemoth state was built on the decimation and displacement of aboriginal tribes, the seizure of vast Mexican lands, and the conquest of Spanish possessions in the Caribbean and South-East Asia. Power was consolidated by the concentration of wealth, the suppression of organized working-class opposition, and the penetration of foreign markets. US elite interest in world affairs often masqueraded as “spreading democracy” but was actually about maximizing the conditions for private profit extraction. The American ruling rich employed nationalist protectionism to promote home industries and resorted to gunboat diplomacy to subdue resistors to its hemispheric hegemony. Protected from the ravages of European and Asian conflagration by two oceans, the US voraciously conscripted public funds to amass and deploy an enormous war machine and graduated to post-WW2 super-power status. Its prime objective then became the elimination of the other super-power, whose post-capitalist basis posed a permanent obstacle, if not an active challenge, to the world capitalist system. Chomsky describes the 1962 Cuban missile crisis in this context, along with a series of bloody US (direct and indirect) interventions to thwart movements for social change from Iran to Nicaragua, from Palestine to Grenada, from Indonesia to Chile. The official excuse offered was “containment of the USSR” and the derivative “war against state-sponsored terrorism.” The heavy irony inherent in the extensive global conduct of US state terrorism (as in the 1989 bombardment of civilian neighborhoods and the killing of thousands of Panamanians just to flush out a single man, the former US client-dictator Manuel Noriega) was not lost on many Latin Americans. Following the collapse of the Soviet Union, however, the stated rationale for US aggressive exertions shifted to a more frank, if not novel, expression. Washington now speaks of “preventive” as opposed to “pre-emptive” war. It thus asserts the right to intervene with force against any nation whose leadership the US claims is considering the development of weapons of mass destruction. Naturally, this criterion does not apply to itself or to its client states. Nor is the approval of the United Nations or adherence to international law required. And with that, Chomsky walks us through two invasions of Iraq, the exorbitant US subsidy and geo-political integration of the colonial-settler state known as Israel, the erosion of civil liberties in the west, the occupation of Iraq and Afghanistan, the establishment of key US military bases in proximity to rich Central Asian oil reserves, and most worrisome, the placement of weapons of mass destruction in outer space — a zone the US intends to “own,” not just control. But isn’t the problem “the system”? And aren’t there signs of a revolutionary challenge to it? 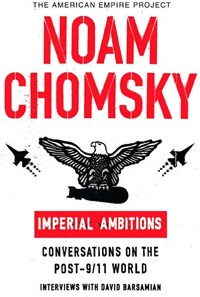 Chomsky’s companion piece, part of the publisher’s American Empire Project series, is Imperial Ambitions: Conversations on the Post-9/11 World, Interviews with David Barsamian (New York: Metropolitan Books, 2005, 226 pages). This fast-flowing dialog retraces some ground but delves more into strategic questions, though not always rewardingly. Elite distrust of democracy and the will of the masses goes back to the foundation of the American republic, so the political establishment has a lot of experience stealing elections and distorting the truth. Chomsky is the expert on how the “consent” of the powerless majority is “manufactured,” including by a kept corporate media. From there it is but a short journey to an “embedded press” in zones of foreign military occupation and to gag laws that curtail domestic dissent and incarcerate swarthy immigrants and selfless lawyers like Lynne Stewart. Long before anti-communism was invented, the US rulers employed their own aggressive nationalism against the aspirations of defenseless, oppressed nations. Now it’s the “war on terrorism,” which was well underway but benefited by a big boost after September 11, 2001. “Clinton’s bombing of Sudan and Afghanistan in 1998 effectively created Al Qaeda,” says Chomsky. The price tag for this manufactured war is manifold, including the reality that “Forty-five million Americans have no (health care) coverage whatsoever.” Add to that “thirty years of either stagnation or decline in real wages, with people working longer hours with fewer benefits.” While “Household debt is out of sight . . . corporate debt is very low. In fact, corporations are making huge profits” and “barely pay taxes.” Money for militarism is diverted from already disintegrating public schools, hospitals, roads, and water services. So what’s behind the drive to destroy Social Security and all the rest? The book argues it’s a drive to reverse the past gains won by labor and other social movements, to the benefit of Wall Street and the capitalist fraternity, who use “national security” propaganda to dull the senses. You might ask, is the “war on terrorism” turning the US into “a failed state”? And who will come to the rescue, if not the awakened ranks of the other global super-power, the vast legions of anti-war, progressive humanity, including its potentially explosive US section? Such an awakening, the stirrings of which were evident in the massive immigrants’ rights protests across America on May 1, 2006, need to be nurtured by teachings that promote political independence from the institutions of capitalist rule. Herein lies a fundamental weakness of the work at hand. But who destroyed the lives of over 50,000 US soldiers (not to mention millions of Vietnamese), and who cut welfare, health care, and education in favor of more cops and jails in America if not the Democrats? And who joined the nearly unanimous vote in Congress to invade Iraq and Afghanistan, and who are amongst the front rank of loyal supporters of Zionist apartheid, anti-Cuba terrorism, militarism, and subversion of democracy from Indonesia to Somalia to Venezuela? Chomsky reveals that his “views grew out of the anarcho-syndicalist tradition.” He affirms his “belief in the value of classical liberal doctrines. . . . Enlightenment ideals — rationality, critical analysis, freedom of speech, freedom of inquiry.” In this way he exposes the extreme limitation of his outlook and “ideals,” insofar as he fails to challenge the political monopoly exercised by the capitalist minority, insofar as he capitulates to at least one of the lying, cheating, murderous political gangs of the plutocracy, and insofar as Chomsky declines even to speculate on the prospect of working-class self-emancipation, an essential step towards which would be the formation of an independent party based on working-class organizations and a set of policies that would advance the basic class interests of the overwhelming majority of Americans. That is the tragedy that dulls the brilliance of Chomsky’s body of work, these two books being no exception. 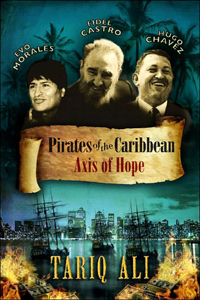 Though the prose is somewhat less accessible, the narrative is compelling in Pirates of the Caribbean: Axis of Hope, by Tariq Ali (London and New York: Verso, 244 pages). Here is a description of the current challenge to the Empire which is mostly absent from the Chomsky books. Tariq Ali, radical pundit, novelist, film maker, political agitator and a former leader of the Trotskyist movement in Britain, shows how the abject failure of the neo-liberal agenda in Latin America has radicalized a new generation and given rise to a series of radical regime challengers to the capitalist status quo. His focus on Cuba, Venezuela, and Bolivia, for obvious reasons, could not be more timely. Though some cynics try to liken Hugo Chavez to yesteryear’s Argentinian populist dictator Juan Peron, Washington seems to know better. It has again and again attempted, through its local henchmen, to remove the repeatedly re-elected Venezuelan President and to derail the Bolivarian revolutionary process. Venezuela’s considerable oil wealth is not new, but the determination of the movement led by Chavez to conquer poverty, illiteracy, and disease and to build an integrated Latin American counter-weight to the US in the form of a continental fair trade and cooperation pact (ALBA) is. It is rightly seen as a serous threat to imperial interests. Combine that with a vision of “twenty-first century socialism” and plans taking shape to replace the bourgeois state with “communal councils,” then add the construction of a unitary grassroots revolutionary socialist party to lead the transition to socialism in Venezuela, firmly allied to revolutionary Cuba, and you have the makings of an epic confrontation with Washington. Ali’s ambiguity on whether the social democratic wealth-redistributing policies of Venezuela, joined last year by Bolivia’s President Evo Morales, and now by Ecuador and Nicaragua, will be sufficient to empower the masses and break the imperial stranglehold is a weakness to be sure. But his failure to articulate what is to be done (apart from organizing international solidarity) does not negate the value of his vivid portrayal of the cowardly, short-sighted, narcissistic, decadent Venezuelan business elite. Ali’s treatment of one Teodor Petkoff, a socialist turned neo-liberal who edits the venomous anti-Chavez daily Tal Cual (As It Is), is a highlight of his tragic-comic tale. Valuable too is Ali’s sketch of Simon Bolivar, the nineteenth-century liberator of Spain’s American domain, his enduring relationship with his revolutionary atheist tutor Simon Rodriguez and to Manuela Saenz, Bolivar’s lover and political soul-mate. The story touches down in Haiti where the first revolution that overthrew slavery and French colonial rule enabled Bolivar to take respite there. He resumed his long military campaign against Spain in 1817 after being supplied with food, money, and arms by Haitian revolutionary leader Alexandre Petion. May Venezuela soon return the favor! Bolivia became Che Guevara’s grave yard in 1967 when he was betrayed by the Stalinist Communist Party and suffered isolation from the indigenous people in the rural interior. In contrast, the mass mobilization of urban and rural laborers of Aymara descent, along with some reduced ranks of the industrial proletariat, rich in radical tradition, combined to bring down the neo-liberal Sanchez de Lozada regime in 2003. These forces then catapulted Evo Morales into the presidency in December 2005, the first fully indigenous person to hold such an office in Bolivia or the continent. Triumphal visits to Havana and Caracas signaled the beginning of a wave of change in terms of literacy and health care services, the nationalization of gas and oil resources, the start of land reform, and a re-write of the constitution to integrate and empower the indigenous but historically excluded majority. Pirates of the Caribbean persuasively depicts a situation pregnant with revolution, and thus with hope, despite the book’s failure to outline a strategy for their realization. “The New Geopolitics of Empire” by John Bellamy Foster, MR, January 2006. “A Warning to Africa: The New U.S. Imperial Grand Strategy” by John Bellamy Foster, MR, June 2006. “A Permanent State of Emergency” by Jean-Claude Paye, introduced by Michael E. Tigar, MR, November 2006. Now I propose to add to this trio of books on politics a text on philosophy. Why? Because it addresses an aspect of today’s anti-establishment ferment. Although humanity is more secular in outlook than ever, religious fundamentalism remains an ideological bulwark of the imperial agenda, and sadly, also a refuge for the oppressed. Christian opponents of abortion and stem cell research in the US are in the front ranks of enthusiasts for the Iraq war, capital punishment, and George W. Bush. In Canada, proponents of public funding for religious schools, of anti-abortion laws, of more money for cops and prisons, including benighted Tory government ministers like Stockwell Day (who stated his belief that the universe was created 5,000 years ago), unite in their hatred of gay marriage, feminist autonomy, quality public child care, and environmental protection. Arcane religious ideologies, so out of step with modernity and strivings for human freedom, are frequent intruders into the public decision-making process. But why should we be surprised? Such an acute expression of the ideological crisis and social polarization of society is part and parcel of life under the decaying world order known as late capitalism. Recognition of the malaise, however, does not imply that we should passively accept it. 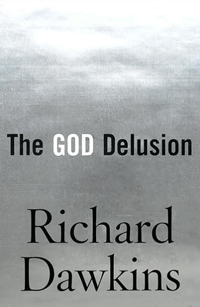 A good antidote to the irrational essence of religious excreta is The God Delusion, by Richard Dawkins (Boston and New York: Houghton Mifflin Company, 406 pages). Dawkins, a science professor at Oxford University, caused a stir in Canada last Fall when he appeared on a CBC-TV Newsworld debate show and instantly became a lightening rod for the thunderbolts of evangelists, rabbis, mullahs, and other soothsayers who tried to label him an arrogant dictator and an intellectual terrorist. His crimes, evidently, were to demand an end to religion’s privilege of place in the media, cultural institutions, and government, and to request equal time for the argument that religion is unhealthy for humanity and the world. The fact that his book went to number one on the best seller charts really rankled the defenders of blind faith. Dawkins, trying not to take himself too seriously, makes the case that it is impossible to know absolutely whether God exists, only that the existence of God is extremely improbable. Some philosophers who wish to cling to a thread of mysticism argue for the “lazy God” theory, akin to the notions of the eighteenth-century deists: God created the universe, then stood back and let everything take its own course. Of course, this doesn’t make much of a case for worship or prayer, since the deity is decidedly inactive, unoccupied, and superfluous. But like all other God theories it still begs the really big question: Who or what created God? The theist argues there is no need to explain. God was always, and is forever. It is a matter outside of, and beyond the realm of, science. But since the onus is on believers to prove what they believe, this argument is a not very artful dodge. Theists, bereft of scientific proof for their beliefs, often find it more convenient to go on the offensive. “Intelligent design” proponents (who seek to re-write school science text books) aim to put a sophisticated face on hokey creationism. Some argue thusly: How could complex life, including complex organisms like the human eye, occur? If not by design, did they occur just by chance? “The creationist completely misses the point, because he . . . insists on treating the genesis of statistical improbability as a single, one-off event. He doesn’t understand the power of accumulation.” To illustrate his point, Dawkins goes on to discuss the primitive eye of the flatworm, and the somewhat more complicated eye of the nautilus, as steps on a continuum. The God Delusion would be glaringly incomplete without paying a lot of attention to the various ideologies of delusion. He examines the huge scriptural contradictions within Christianity and suggests that this is also the case for the multitude of other religions. He excoriates the vicious cruelty sanctioned by faith — the intense bigotry, oppressive discrimination, and blatant female and child abuse perpetuated in its various names. For the purposes of generating a civilized society, Dawkins maintains, humanity has no need of the irrational crutch of ages, that we are quite capable of respecting individual and collective rights on a secular basis — in fact humanity is much more capable of doing so free of religious baggage. Alas, Dawkins is not a historical materialist, which is evident when he strays into the realm of politics and sociology. He tends to reduce national oppression to a matter of pure religious bigotry . Whether it concerns Irish nationalists in the British-occupied Orange state-let, or Palestinians under Zionist occupation, or Arabs and Muslims suffering harassment in North America, Dawkins fails to see, or at least declines to explain, that in capitalist class society the ruling elite fosters bigotry to seemingly justify social inequality, to lower their costs, to maximize their profits, and to divide so as to rule. He does not attempt to explain the origins of Christianity, Islam, or any religion as an expression of distinct class interests at their genesis. One must look elsewhere for that, such as in Karl Kautsky’s seminal “Foundations of Christianity” (1908). The God Delusion is an informed, articulate, humanist response to irrational, reactionary ideologies. It does not purport to be a guide to the new world that free-thinking humanity yearns to create. Nor should it be regarded as an impediment to collaboration with Liberation Theologists, anti-imperialist Muslims, or anti-Zionist Jews. But it is an important component of what activists need today — ammunition against the Empire. Barry Weisleder is a Canadian socialist activist.